Obstetrician Tora Hamilton moves with her husband Duncan to his birth-place of Shetland, both starting new jobs. She takes her beloved horses with her but unfortunately one dies, and it is when she is burying him (illegally) in her garden that she discovers the body of a young woman, wrapped in linen. The main police officer in charge, tries to play down the find and does not seem to be treating it seriously even when the post mortem reveals extensive mutilation of the body, including the carving of Viking runes on the body. The crucial point for Tora is that the woman had given birth days before her death. Tora is not happy about the situation and uses her position at the hospital to try and trace the woman even though she is warned off by both colleagues and family. Her only ally is DS Dana Tulloch with whom she has a prickly relationship. Tora diggers herself deeper into trouble and as she does so, Sacrifice becomes a full-blown thriller with near death experiences, chase sequences and going it alone into enemy territory. 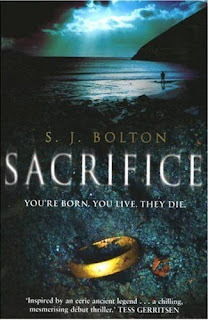 Though it took me a few disks to get into Sacrifice, by the fourth one I was engrossed. It is peopled by several strong female characters, whom you can root for, as they try to get to the bottom of seemingly impossible crimes. The setting of the Shetland Islands is well utilised and brought to life. I found the plot, though based on local legends, slightly outlandish, but if you can suspend disbelief then you're in for an exciting ride. My only slight quibble is that the ending is perhaps a bit happier than you would expect given what's gone before. Scottish actress Vivien Heilbron provides a splendid narration, her clipped English accent matching well with Tora's no-nonsense approach. (Incidentally, she is married to one of my favourite narrators, David Rintoul). I read this in print and thoroughly enjoyed it - I agree the female characters are excellent and I am a sucker for remote settings. The beginning, where she's trying to bury the horse, left a surprisingly long lasting image in my head (I'm a city girl, I'd never thought about how to dispose of equine remains before). Wow, this sounds really good! Shetland & bodies in the garden - real favourites of mine.